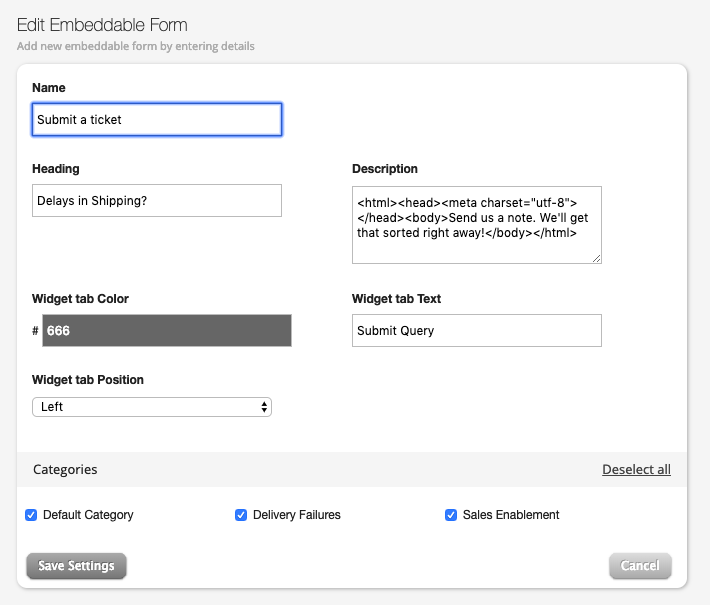 Embed Forms integration in HappyFox allows you to create embeddable forms and place them on any website of your choice. The form is invoked whose placement on the page, color and text can be customized. The widget raises HappyFox tickets using the information filled by users visiting your website. Go to Apps >> Goodies >> Embed Forms. Click "Create an embeddable form". Provide the name, heading, description, Widget tab text, Widget tab position. Associate categories for which this embeddable forum can be used create tickets. Click Save Settings to create the widget. In the subsequent screen, Copy the JQuery/HTML code snippet, and paste it on your website's code. You may choose to preview your widget in a sample website if needed. To know how Embed forms work in HappyFox Classic, please refer to the document attached.